Thyme (Thymus vulgaris) is a savory herb that is often used to flavor meat, seafood, and vegetable dishes. It is a member of the mint (Lamiaceae/Labiatae) family and has been used for centuries dating back to the ancient Greeks and Egyptians. While you might use this easy-to-find herb in your cooking, many people also enjoy the health benefits of thyme. Thyme is also used to stimulate the appetite and to boost water loss. You should note, however, that to date, there is not enough evidence to support the use of thyme for any of these conditions. 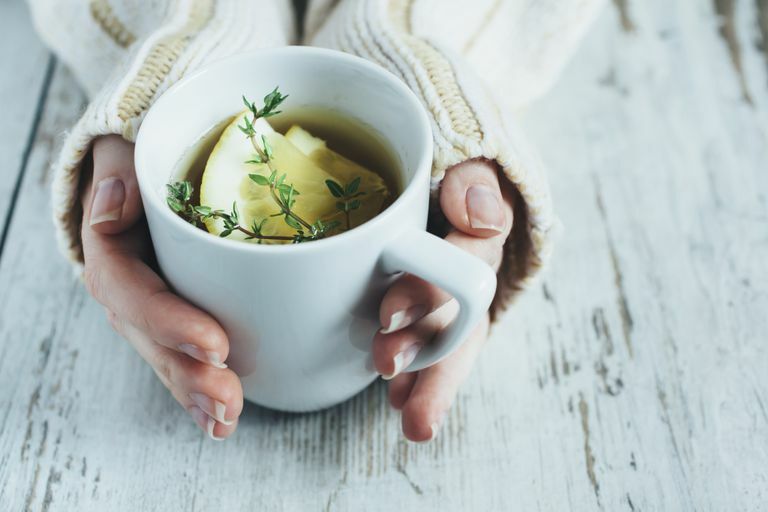 There is some preliminary evidence that using thyme along with other herbs may help relieve coughing in patients with upper respiratory infections or common colds. Some studies also indicate that herbal combinations that include thyme may help relieve symptoms of bronchitis. Lastly, thyme may help stimulate hair growth. A clinical study found that lavender oil applied topically with essential oils from thyme, rosemary, and cedarwood was able to increase hair growth. There are almost no calories in thyme. A single serving of thyme is about 2 tablespoons of the fresh herb or about 1 teaspoon of the dried herb. There is less than 1 calorie in a single serving. The calories in thyme come from carbohydrate, primarily fiber. You won't significantly boost your vitamin or mineral intake by consuming thyme. However, you'll get a small dose of vitamin A, vitamin C, magnesium, and potassium. When you purchase fresh thyme, you'll find it in the produce section of your market. Select thyme that has woody tall stalks with vibrant green or greyish green leaves. You want to select thyme that does not have visible flowers. When you bring fresh thyme home, do not wash it until you are ready to use it. You can wrap the thyme in a paper towel and place the bundle in a plastic bag. Store thyme in the refrigerator where it should stay fresh for about a week or more. When using thyme, separate the leaves from the stems by running your finger down the stem. Thyme has a flavor that is often described as piney. Some people also taste bitter, floral, herbaceous flavors. It is often included in seasoning blends such as bouquet garni and herbes de Provence. Use it to flavor fish and poultry dishes, pasta meals, or try it in one of the following recipes. Thyme is Generally Recognized as Safe (GRAS) according to the U.S government when used in amounts commonly found in food. According to the Natural Medicines database, thyme is likely safe for adults, children, and pregnant and lactating women when used to flavor food and possibly safe when used for medicinal purposes. Thyme applied topically may cause skin irritation and some people have reported stomach discomfort after consuming thyme. People taking certain medications including acetylcholinesterase (AChE) inhibitors, anticholinergic drugs, anticoagulant or antiplatelet drugs, cholinergic drugs, or estrogens should speak to their healthcare provider before using thyme. Scientists have theorized that thyme can make hormone-sensitive conditions worse. For that reason, women with breast cancer, uterine cancer, ovarian cancer, endometriosis, or uterine fibroids should be cautious about using thyme. In addition, thyme may cause excessive bleeding or bruising if used in high amounts by people with bleeding disorders. You may also want to avoid thyme for two weeks prior to surgery. Allergic reactions to thyme are rare but are more likely to occur in people who are allergic to oregano and other Lamiaceae species. Yes. Freeze thyme with the leaves still on the stems. Place the stems in a plastic bag and freeze until you are ready to use them. Are there different varieties of thyme? There are many different varieties of thyme including lemon thyme, narrow-leaf French thyme, and broadleaf English thyme. The variety that you most commonly see in the market is Thymus vulgaris or common thyme. Buechi, S., Vogelin, R., von Eiff, M. M., Ramos, M., and Melzer, J. Open trial to assess aspects of safety and efficacy of a combined herbal cough syrup with ivy and thyme. Forsch.Komplementarmed.Klass.Naturheilkd. 2005;12(6):328-332. DOI: 10.1159/000088934. Ernst E, Marz R, Sieder C. A controlled multi-centre study of herbal versus synthetic secretolytic drugs for acute bronchitis. Phytomedicine 1997;4:287-93. DOI: 10.1016/s0944-7113(97)80035-9. Natural Medicines Comprehensive Database. Thyme Full Monograph. 08/15/2018. Hay IC, Jamieson M, Ormerod AD. Randomized trial of aromatherapy. Successful treatment for alopecia areata. Arch Dermatol 1998;134:1349-52. DOI: 10.1001/archderm.135.5.602-b. Zava DT, Dollbaum CM, Blen M. Estrogen and progestin bioactivity of foods, herbs, and spices. Proc Soc Exp Biol Med 1998;217:369-78. DOI: 10.3181/00379727-217-44247.